I am working on an enzyme assay for a fungal pectinase.I assayed the enzyme in different buffers from pH 1-12.5 However,the enzyme has good activities starting from pH1-10.5. Is it possible to have enzyme activity over such a broad range of pH? The first is from an article ("Immobilization of pectinase by adsorption on an alginate-coated chitin support") which compares the activity of native and immobilized pectinase under different conditions. The second is from the datasheet of a company which sells the enzyme. 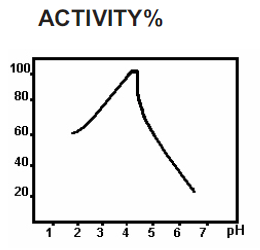 Both show an activity over 50% roughly between pH 3.5 and 5.5 but not at higher or lower pH values. Not the answer you're looking for? Browse other questions tagged biochemistry molecular-biology microbiology enzymes biotechnology or ask your own question.